Having expounded many of the central, saving doctrines of the gospel (see Romans 1–8), Paul then focused on the application of the gospel in Church and civic life (see Romans 9–16). In Romans 9–11, Paul dealt with Israel’s election, rejection of the gospel, and eventual salvation. Though God had made His covenant anciently with Abraham and his posterity, God’s chosen people were determined not primarily by lineage but by faithfulness to the covenant. Church members could prepare the way for those outside the Church to accept the gospel by being faithful, humble, and merciful. In Romans 12–15, Paul counseled Church members to live the gospel in order to foster peace and Church unity. This requires willingness to sacrifice, to trust the Lord, and to subordinate self-interest to the interests of others. Paul closed his epistle with an account of his future plans, a request for the prayers and assistance of the Saints in Rome, and a plea for those same Saints to continue obeying the gospel. In Romans 9–11, Paul used the terms Israel and Israelites instead of Jews. Paul used Israel to mean God’s covenant people, the house of Israel, in contrast to the Jews of his day, who had largely rejected the Savior. In Old Testament times God had chosen the house of Israel to be His covenant people, and He promised that the Savior would come to them (see Romans 9:4–5). But when Jesus Christ came to earth, most Jews dismissed him and some put him to death, and His followers faced continuing opposition from Jewish leaders, who were members of the house of Israel. One of Paul’s purposes in Romans 9–11 was to address the Jews’ rejection of the Savior and the implications of this rejection. Why did the gospel of Jesus Christ not result in more conversions among the very people who had been given the promise of the Messiah? Paul maintained that Israel’s refusal of the gospel did not mean that “the word of God hath taken none effect” (Romans 9:6). Just because the Jews in general had rejected Jesus Christ, this did not make the gospel message fruitless or ineffectual. Paul reasoned that not all people who were Israelite by lineage could be considered to be part of covenant Israel (see Romans 9:6–11); the word of God was taking root among the Gentiles. Elder Bruce R. McConkie (1915–85) of the Quorum of the Twelve Apostles explained: “Some of [the house of Israel], after such a favored birth, after being numbered with the chosen seed, turn from the course of righteousness and become children of the flesh; that is, they walk after the manner of the world, rejecting the spiritual blessings held in store for Israel” ( Doctrinal New Testament Commentary, 3 vols. [1965–73], 2:276). Paul also observed that Israel’s rejection of the gospel and the taking of the gospel to the Gentiles fulfilled prophecy, verifying God’s word rather than discrediting it (see Romans 9:14–29; Ephesians 3:3–6). Paul taught that not all people born into the house of Israel actually receive the promises of the Lord’s covenant with Israel (see Romans 9:6). Paul noted that the Lord’s covenant with Abraham was perpetuated only through the lineage of Isaac and not through that of Ishmael, Abraham’s other son. Paul used this illustration to prepare his readers to be taught that faithful Gentiles may be counted as part of Israel and receive the blessings of the gospel covenant (see Romans 9:8, 24–26; 10:12; Galatians 3:27–29; see also the commentary for Luke 3:8). Paul’s teachings also show that although someone may be born into a favored lineage or a family of great faith, he or she cannot receive the blessings of gospel covenants without being obedient to God’s commandments. Similarly, a Latter-day Saint can be saved only through individual faith and obedience. President Russell M. Nelson taught: “The development of faith in the Lord is an individual matter. … Each of us is born individually; likewise, each of us is ‘born again’ [John 3:3, 7] individually. Salvation is an individual matter” (“Salvation and Exaltation,” Ensign or Liahona, May 2008, 8). “The elect are chosen even ‘before the foundation of the world,’ yet no one is unconditionally elected to eternal life. Each must, for himself, hearken to the gospel and receive its ordinances and covenants from the hands of the servants of the Lord in order to obtain salvation. If one is elected but does not serve, his election could be said to have been in vain, as Paul expressed in 2 Cor. 6:1. “… An ‘election of grace’ spoken of in D&C 84:98–102 and Rom. 11:1–5 has reference to one’s situation in mortality; that is, being born at a time, at a place, and in circumstances where one will come in favorable contact with the gospel. This election took place in the premortal existence. Those who are faithful and diligent in the gospel in mortality receive an even more desirable election in this life and become the elect of God. These receive the promise of a fulness of God’s glory in eternity (D&C 84:33–41)” (Bible Dictionary, “Election”; see also Alma 13:3–4). Latter-day prophets have taught that those born into the house of Israel were foreordained to that lineage in premortality. Elder Bruce R. McConkie explained: “The greatest and most important talent or capacity that any of the spirit children of the Father could gain is the talent of spirituality. Most of those who gained this talent were chosen, before they were born, to come to earth as members of the house of Israel. They were foreordained to receive the blessings that the Lord promised to Abraham and to his seed in all their generations. This foreordination is an election” ( A New Witness for the Articles of Faith , 512). “God chose Jacob over Esau while the two were yet in Rebecca’s womb and before either, as far as the works of this life are concerned, had earned any preferential status. Why? It is a pure matter of pre-existence. Jacob was coming into the world with greater spiritual capacity than Esau; he was foreordained to a special work; he was elected to serve in a chosen capacity. “Then through the lineage of Jacob, God sent those valiant spirits, those noble and great ones, who in his infinite wisdom and foreknowledge he knew would be inclined to serve him. Through Esau came those spirits of lesser valiance and devotion. Hence, in the very nature of things, many of Jacob’s seed were righteous in this life, and many of Esau’s were wicked, causing Malachi to say in the Lord’s name, some fifteen hundred years later, that God loved the house of Jacob and hated the house of Esau. (Mal. 1:2–3. )” ( Doctrinal New Testament Commentary, 2:277). As Paul wrote about the foreordination of the house of Israel, he realized that some Church members might feel that the doctrine of election was unfair. Gentile Saints might have wondered why God restricted His covenant anciently to Abraham and his descendants, while Jewish Christians might have wondered why God would accept Gentiles into the Church and consider them part of the house of Israel. Paul’s counsel to his readers was not to dispute against God (see Romans 9:20, footnote a; in this verse repliest means “contradict” or “dispute”). Romans 9:17–18, 22–24. Does God Cause People to Be Hard-Hearted? In Romans 9:17, Paul quoted Exodus 9:16, which states that God raised up Pharaoh in order to show His power. Paul also said, “Whom [God] will he hardeneth” (Romans 9:18). These passages do not mean that God caused Pharaoh or other people to be wicked. Such an interpretation would contradict truths taught elsewhere in the scriptures about how God desires the salvation of all people (see 1 Timothy 2:4; 2 Peter 3:9; Moses 1:39) and how God’s gift of agency makes us free to choose to follow Him or reject Him (see 2 Nephi 2:27; 10:23). A key to understanding Paul’s statement is to recognize that he was reasoning from the book of Exodus, which tells of the Pharaoh who opposed God’s deliverance of Israel from Egypt. The Exodus account, which would have been familiar to Paul’s readers, speaks of God hardening Pharaoh’s heart (for example, see Exodus 9:12). The Joseph Smith Translation clarifies that the Lord did not harden Pharaoh’s heart, but that Pharaoh hardened his own heart (see Joseph Smith Translation, Exodus 9:12 [in Exodus 9:12, footnote a]). Paul’s point was that even though Pharaoh fought against God, this did not frustrate the Lord’s work of delivering Israel. Ultimately, Israel’s deliverance in spite of Pharaoh’s stubbornness served to reveal the Lord’s power (see Romans 9:17). Similarly, God did not cause Israel to reject the gospel of Jesus Christ, but He permitted it. Israel’s rebellion was something God “endured with much long-suffering” (Romans 9:22) so that He could “make known the riches of his glory” to those who accept the gospel, “not of the Jews only, but also of the Gentiles” (Romans 9:23–24). Brotherhood, by Roger Loveless. Gentile converts who join the Church are counted as part of the house of Israel, fulfilling the scripture “I will call them my people, which were not my people” (Romans 9:25; see also Hosea 2:23). In Romans 9:25–26, Paul quoted from Hosea 1:10; 2:23 (he referred to Hosea as “Osee”), and in Romans 9:29, he quoted from Isaiah 1:9; 29:16 (see also Romans 9:20). By referring to these Old Testament prophets, Paul taught that God’s desire is to save all His children and that many Gentiles, who are not His people by birth, will become His people by being grafted into the gospel covenant. Paul wrote that Israel sought righteousness “by the works of the law” (that is, by the rituals and observances of the law of Moses) rather than by faith in Jesus Christ (Romans 9:32). President M. Russell Ballard of the Quorum of the Twelve Apostles taught that Latter-day Saints sometimes commit a similar error by placing too much emphasis on works: “No matter how hard we work, no matter how much we obey, no matter how many good things we do in this life, it would not be enough were it not for Jesus Christ and His loving grace. On our own we cannot earn the kingdom of God﻿—no matter what we do. Unfortunately, there are some within the Church who have become so preoccupied with performing good works that they forget that those works﻿—as good as they may be﻿—are hollow unless they are accompanied by a complete dependence on Christ” (“Building Bridges of Understanding,” Ensign, June 1998, 65). Although the Saints in Rome were often rejected by the Jews, we learn that Paul continued to love and respect the Jews and had concern for their salvation (see Romans 10:1–3). He said that many Jews went about “to establish their own righteousness,” which meant that they were zealously striving to establish their own righteousness according to Jewish standards. They did not submit themselves to “the righteousness of God,” which was the gospel of Jesus Christ. They rejected the gospel that could have ultimately led them to true righteousness. The word end in Romans 10:4 can mean “conclusion” or “fulfillment,” or it can mean “an ultimate purpose or anticipated object.” The performances of the law of Moses anticipated the Savior and His Atonement, which represent the “end” of the law (see Galatians 3:24–26; Mosiah 13:28–33; 16:13–15; Alma 25:15–16). Romans 10:4–13. Is Confessing Belief in Christ All One Must Do to Be Saved? Some Christians have used Paul’s words in Romans 10:9 to claim that all a person must do to be saved is to verbally confess a belief in Jesus Christ. However, in other passages, Paul taught that repentance, baptism, receiving the Holy Ghost, and striving to follow the teachings of Jesus Christ are also essential (see Acts 16:30–33; 19:1–6; Romans 6:1–11; Galatians 3:26–27; 5:13–25). In Romans 10:4–13, Paul’s purpose was not to give a comprehensive description of the process of salvation. Instead, Paul was supporting the point that he stated in verse 4: “Christ is the end of the law for righteousness to every one that believeth.” Paul quoted Deuteronomy 30:12–14 to make the point that one need not “ascend into heaven” or “descend into the deep” to find Christ (Romans 10:6–7). Instead, all people﻿—whether Jew or Greek﻿—can find the Savior within their own hearts as they confess that He is the Savior and have faith in Him (see Romans 10:8–12). “Relying upon the totality of Bible teachings and upon clarifications received through modern revelation, we testify that being cleansed from sin through Christ’s Atonement is conditioned upon the individual sinner’s faith, which must be manifested by obedience to the Lord’s command to repent, be baptized, and receive the Holy Ghost (see Acts 2:37–38). ‘Verily, verily, I say unto thee,’ Jesus taught, ‘Except a man be born of water and of the Spirit, he cannot enter into the kingdom of God’ (John 3:5; see also Mark 16:16; Acts 2:37–38). Believers who have had this required rebirth at the hands of those having authority have already been saved from sin conditionally, but they will not be saved finally until they have completed their mortal probation with the required continuing repentance, faithfulness, service, and enduring to the end” (“Have You Been Saved?” Ensign, May 1998, 55). “‘How beautiful are the feet of them that preach the gospel of peace, and bring glad tidings’ (see also Isaiah 52:7). “It has been observed that the members are going to have to move their feet and let their voices be heard if they are to achieve this blessing” (“Live by Faith and Not by Fear,” Ensign or Liahona, Nov. 2007, 72). Paul taught that hearing the word of God is essential to developing faith in Jesus Christ. This teaching helps us understand that attendance at Sabbath day and other Church meetings plays a vital role in the development of faith. Elder Robert D. Hales (1932–2017) of the Quorum of the Twelve Apostles taught: “The Apostle Paul wrote to the Romans, ‘Faith cometh by hearing, and hearing by the word of God’ [Romans 10:17]. … The first step to finding faith in the Lord Jesus Christ is to let His word﻿—spoken by the mouth of His servants, the prophets﻿—touch your heart. But it is not enough merely to let those words wash over you, as if they alone could transform you. We must do our part. Or as the Savior Himself said, ‘He that hath ears to hear, let him hear’ [Matthew 11:15]. In other words, hearing requires an active effort. … It means taking seriously what is taught, considering it carefully, studying it out in our minds. As the prophet Enos learned, it means letting others’ testimonies of the gospel ‘[sink] deep into [our] heart[s]’ [Enos 1:3]” (“Finding Faith in the Lord Jesus Christ,” Ensign or Liahona, Nov. 2004, 72). Even though many Jews did not accept Jesus as their Savior, Paul pointed out that God had not cast away His chosen people. As evidence of this, Paul pointed out that he himself was of the house of Israel (see Romans 11:1). Paul went on to explain that in the time of ancient Israel, some people accepted God while others did not. He quoted an Old Testament account describing Elijah’s despair over the wickedness of Israel’s people, many of whom had turned to worshipping false gods such as Baal. Elijah believed that he was the only righteous Israelite remaining; however, God told him, “I have left me seven thousand in Israel, all the knees which have not bowed to Baal” (1 Kings 19:14–18; Romans 11:2–4). Elder Bruce R. McConkie explained: “As in the day of Elijah, so in the day of Paul, a few of Israel, a few of those foreordained and elected to receive the blessings of God in this life, a remnant of a once great nation, had remained faithful and true” ( Doctrinal New Testament Commentary, 2:285). The faithful remnants of Israel in Paul’s day were those Jews who, like him, had accepted Jesus Christ as the long-promised Messiah. Paul maintained that Israel had not fallen permanently, and he taught that Israel would experience a future “fulness” of salvation (see Romans 11:11–12) in contrast to the smaller “remnant” of Jewish converts in Paul’s day (see also 2 Corinthians 3:14–16). Many Book of Mormon prophecies also speak of the Lord’s plan for Israel’s eventual salvation. For example, Nephi declared, “Those who are of the house of Israel … shall be brought out of obscurity and out of darkness; and they shall know that the Lord is their Savior and their Redeemer, the Mighty One of Israel” (1 Nephi 22:11–12). Jesus taught the Nephites that the Restoration of the Church in the latter days, including the coming forth of the Book of Mormon, was part of the Lord’s plan to gather and redeem Israel; it was to be a sign to the world that the fulfillment of His promises had commenced (see 3 Nephi 21:1–7). In his special role as “the apostle of the Gentiles,” Paul directed the next part of his discourse to Gentile converts, as he felt a great responsibility to magnify his office (Romans 11:13). President Thomas S. Monson (1927–2018) taught: “What does it mean to magnify a calling? It means to build it up in dignity and importance, to make it honorable and commendable in the eyes of all men, to enlarge and strengthen it to let the light of heaven shine through it to the view of other men. And how does one magnify a calling? Simply by performing the service that pertains to it. An elder magnifies the ordained calling of an elder by learning what his duties as an elder are and then by doing them. As with an elder, so with a deacon, a teacher, a priest, a bishop, and each who holds office in the priesthood” (“Priesthood Power,” Ensign, Nov. 1999, 51). In Romans 11:16–24, Paul taught about branches that had been “grafted in” to an olive tree, referring to Gentiles who were “adopted in” to the house of Israel (see Romans 11:17, 19, 23–24). The natural olive tree is Israel, while the wild branches are the Gentiles. The Gentiles (the wild branches) were grafted into the house of Israel (the tame tree) and became part of Israel. This analogy from agriculture described a process that was contrary to nature, for in the natural world, grafted branches control the destiny of the tree. A branch from a tame tree that is grafted into a wild tree makes the wild tree become tame. Paul described a process of wild branches being grafted into a tame tree, with the tree remaining tame. Paul used the analogy in this way not out of ignorance, but to make a point. The conversion of the Gentiles did not change the destiny of the house of Israel, for the house of Israel is of great importance in the kingdom of God. Even though the gospel was being taken to the Gentiles during Paul’s ministry, Israel was still the chosen family and the guardian of the Abrahamic covenant. Paul warned Gentile members of the Church to “be not highminded.” He admonished them to be humble and faithful and not to think they were better than Jews who had not embraced the gospel (see Romans 11:18–20). Paul explained that by showing mercy and kindness to the Jewish people, Gentile Christians could prepare the way for Jews to eventually embrace the gospel and receive the Lord’s mercy (see Romans 11:30–31). If the Gentile members were prideful, they would suffer the same fate as the unrepentant Jews and be cut off from God’s kingdom. This warning﻿—to not be highminded or prideful﻿—should be heeded by all people who love the Lord and desire to return to God’s presence. History shows that later Gentile Christians largely failed to follow Paul’s counsel and became hostile toward Jews. In later centuries after Christians became a majority with political power, the rise of hateful, anti-Jewish rhetoric among them led to violence against Jews. The Book of Mormon prophet Nephi wrote: “O ye Gentiles, have ye remembered the Jews, mine ancient covenant people? Nay; but ye have cursed them, and have hated them, and have not sought to recover them. But behold, … I the Lord have not forgotten my people. … And I will show unto them that fight against my word and against my people, who are of the house of Israel, that I am God, and that I covenanted with Abraham that I would remember his seed forever” (2 Nephi 29:5, 14). Paul spoke of both God’s “goodness” and His “severity.” Why do you think Paul used these contrasting terms to describe God? What does this verse mean for your life? Elder Bruce R. McConkie discussed the meaning of “the fulness of the Gentiles”: “There was a period or time appointed for the Jews to hear the word, and then a period of time for the Gentiles to take precedence. The times of the Gentiles is the period during which the gospel goes to them on a preferential basis, and this will continue until they have had a full opportunity to accept the truth, or in other words until the fulness of the Gentiles. Then the message will go again to the Jews, meaning to the Jews as a nation and as a people” ( Doctrinal New Testament Commentary, 2:290). For more insight on the times of the Gentiles, see the commentary for Luke 21:24. Elder D. Todd Christofferson of the Quorum of the Twelve Apostles taught: “As our body is the instrument of our spirit, it is vital that we care for it as best we can. We should consecrate its powers to serve and further the work of Christ. Said Paul, ‘I beseech you therefore, brethren, by the mercies of God, that ye present your bodies a living sacrifice, holy, acceptable unto God’ (Romans 12:1)” (“Reflections on a Consecrated Life,” Ensign or Liahona, Nov. 2010, 17). When Paul spoke of giving our bodies as “a living sacrifice,” he drew a parallel to the Old Testament practice of sacrificing animals. President Russell M. Nelson taught: “We are still commanded to sacrifice, but not by shedding blood of animals. Our highest sense of sacrifice is achieved as we make ourselves more sacred or holy. This we do by our obedience to the commandments of God. Thus, the laws of obedience and sacrifice are indelibly intertwined. … As we comply with these and other commandments, something wonderful happens to us. We become disciplined! We become disciples! We become more sacred and holy﻿—like our Lord!” (“Lessons from Eve,” Ensign, Nov. 1987, 88). “Ed passed away three years ago at the age of 96. If you had attended Ed’s funeral, you would have thought it was the funeral for one of the greatest individuals who had ever lived﻿—and actually, it was. It was the funeral for my father’s lifelong friend, Ed Erickson” (“My Father Is a Prophet” [Brigham Young University–Idaho devotional, Feb. 19, 2008], byui.edu). For insights on Paul’s teachings about how members of the Church are “many members in one body” (Romans 12:4), see the commentary for 1 Corinthians 12:12–30. Much as the Savior did in the Sermon on the Mount (see Matthew 5–7), Paul provided counsel to Church members and taught them many principles about living a Christian life. Romans 12:9–21 contains verse after verse of such teachings. Love “without dissimulation” is love without hypocrisy; it is “love unfeigned” (Romans 12:9; D&C 121:41). Paul’s counsel to “mind not high things, but condescend to men of low estate” (Romans 12:16) is reminiscent of the Savior’s exhortation in Matthew 5:46–47 to be kind, even to the publicans (those who were despised). Paul’s words in Romans 12:14–15, 21 have counterparts in Matthew 5:44; Mosiah 18:9; and Doctrine and Covenants 42:45. What counsel did Paul give in this verse? What teachings in Romans 12 would help you follow this counsel? Less than a decade after Paul counseled the Saints to be subject to government authorities, Jews in Palestine revolted against Rome, resulting in the destruction of the temple of Jerusalem. The last zealot holdouts retreated to the mountaintop fortress of Masada (shown here) near the Dead Sea and were finally conquered by Roman forces in A.D. 73. These verses also contain some of the clearest New Testament descriptions of a disciple’s civic responsibility. There were good reasons for Paul to counsel Christians to be subject to civil authorities. Roman rulers placed a high priority on maintaining peace and quelling social unrest, and revolts were put down swiftly and violently. Earlier in Paul’s ministry, unrest in the Jewish community in Rome had led to the expulsion of all Jews from the city for a time (see Acts 18:2). Paul gave specific instructions about civic duties to help the Church avoid harm in potentially volatile circumstances (see verses 6–10, 13–14). Paul’s counsel to “be subject unto the higher powers” (Romans 13:1) reflects the principle of the twelfth article of faith: “We believe in being subject to kings, presidents, rulers, and magistrates, in obeying, honoring, and sustaining the law.” By describing civil authorities as being “ordained of God” and “God’s ministers” (Romans 13:1, 6), Paul acknowledged that all who hold positions of power are accountable to God, and they hold power only to the extent that God allows (see John 19:11). Paul’s imagery in Romans 13:12 is similar to that found in Ephesians 6:11–17, where he urged readers to “put on the whole armour of God.” In the Romans passage, Paul admonished readers to cast off the works of evil and to arm themselves with the “armour of light,” perhaps referring to Jesus Christ, who is the light and life of the world. Elder Robert D. Hales of the Quorum of the Twelve Apostles taught: “My brothers and sisters, in this, the last great conflict between light and darkness, I am grateful for the opportunity to ‘endure hardness, as a [disciple] of Jesus Christ’ [2 Timothy 2:3]. With Paul, I declare, ‘The night is far spent, the day is at hand: let us therefore cast off the works of darkness, and let us put on the armour of light’ [Romans 13:12]. I bear my special witness that Jesus Christ ‘is the light and the life of the world; yea, [the] light that is endless, that can never be darkened’ [Mosiah 16:9]” (“Out of Darkness into His Marvelous Light,” Ensign, May 2002, 71). Paul’s counsel to “make not provision for the flesh” (Romans 13:14) reflects the truth that controlling our thoughts is crucial to withstanding temptations. The Greek word translated as provision means “forethought.” When people succumb to temptation, it is often because they have allowed themselves to dwell on the temptation and think about committing the sin. President Boyd K. Packer (1924–2015) suggested one way we can control our thoughts: “When temptation comes, you can invent a delete key in your mind﻿—perhaps the words from a favorite hymn. Your mind is in charge; your body is the instrument of your mind. When some unworthy thought pushes into your mind, replace it with your delete key. Worthy music is powerful and can help you control your thoughts” (“Prayer and Promptings,” Ensign or Liahona, Nov. 2009, 46). Paul pointed out that some Church members chose to “eat all things” while others chose to eat only “herbs,” or in other words, vegetables (Romans 14:2, footnote a). Those who ate only vegetables were likely Jewish converts, while those who ate other foods were probably Gentile converts. In addition, some Church members chose to follow Jewish customs, practices, and holidays (see Romans 14:5). 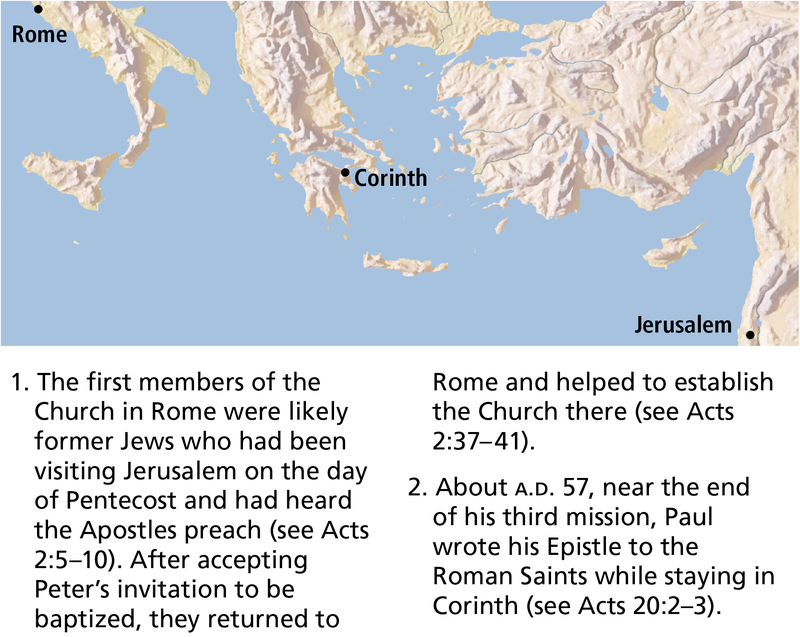 These differences in personal practices led to divisions among Saints in Rome and other locations (see Romans 14:3; 1 Corinthians 8:1–13; Colossians 2:16). In response to this problem, Paul taught that many personal choices concerning diet and other practices were not addressed by any specific commandment. Therefore, these were matters to be decided between the individual and the Lord (see Romans 14:6–8). Paul taught that we should not impose our private interpretations on fellow Church members or pass judgment on those who live differently (see Romans 14:10–15; see also 3 Nephi 11:40). On the other hand, Church members should consider the effect of their personal practices on others and be willing to forgo some actions if they might cause another to stumble spiritually (see Romans 14:13–15, 20–22; 1 Corinthians 8:9–13). Promoting peace and edification in the Church is a higher priority than maintaining personal preferences (see Romans 14:19; 15:1–3). Some actions and priorities simply matter more than others (see Romans 14:17, 19). “I remember interviewing a discouraged missionary. He was having trouble with a language which was not his own. He had lost the spirit of his work and wanted to go home. He was one of 180 missionaries in that mission. “I told him that if he were to go home he would break faith with his 179 companions. Every one of them was his friend. Every one of them would pray for him, fast for him, and do almost anything else to help him. They would work with him. They would teach him. They would get on their knees with him. They would help him to learn the language and be successful because they loved him. “I am happy to report that he accepted my assurance that all of the other missionaries were his friends. They rallied around him, not to embarrass him, but to strengthen him. The terrible feeling of loneliness left him. He came to realize that he was part of a winning team. He became successful, a leader, and he has been a leader ever since. “That’s what each of us must do for one another. “Paul wrote to the Romans, ‘We then that are strong ought to bear the infirmities of the weak.’ And then he added these significant words, ‘And not to please ourselves.’ (Rom. 15:1. )” (“Strengthening Each Other,” Ensign, Feb. 1985, 3). Paul noted that the scriptures were written “for our learning” and to provide comfort and hope (Romans 15:4). To illustrate this truth, Paul then quoted several Old Testament scriptures to reassure the Saints that missionary work to the Gentiles was in accordance with God’s plan, and he encouraged all Church members to accept one another (see Romans 15:9–12, which quotes Psalm 18:49; Deuteronomy 32:43; Psalm 117:1; and Isaiah 11:10). According to this verse, how do we receive hope? What is the relationship between this verse and the statement in Romans 15:4 that the scriptures can give us hope? Romans 15:24, 28. Did Paul Ever Journey to Spain? Paul intended ultimately to travel to Spain (see Romans 15:24, 28). Though it is not known for certain whether Paul ever made it to Spain, there is some evidence suggesting that he did fulfill this desire: “Writing about A.D. 96, Clement of Rome said that Paul had reached the ‘boundaries’ or ‘limits of the west,’ a phrase far more appropriate for Spain than for Rome. The early Muratorian Fragment also says that Paul visited Spain, though its source of information is debated” (Richard Lloyd Anderson, Understanding Paul, rev. ed. , 311–12). At the close of his epistle, Paul highly commended a Church member named Phebe, who was evidently the messenger who carried Paul’s epistle to the Saints in Rome. From Paul’s description of Phebe, we learn that she was “a servant of the church which is at Cenchrea” and that she had been a “succourer” or benefactor of many members of the Church, including Paul (Romans 16:1–2). Phebe is an example of the important and trusted role women have in the Church. Paul’s written approval of Phebe is an example of the early Christian practice of carrying letters of recommendation when traveling to another Christian congregation (see 2 Corinthians 3:1). This custom is similar to the current Church practices of transferring membership records and carrying temple recommends. A Roman-era scribe is depicted on a tombstone found at Flavia Solva in modern-day Austria. At the end of the Epistle to the Romans, the scribe who had written the epistle under Paul’s direction inserted his own greeting to the Saints in Rome: “I Tertius, who wrote this epistle, salute you in the Lord” (Romans 16:22; compare 1 Peter 5:12). Paul may have used scribes to compose many or all of his epistles. Ancient scribes had varying degrees of influence in what they wrote. Some would write a manuscript word for word as dictated by the sender, others would revise and edit a draft written by the sender, and others would compose much of a text themselves, working from notes or instructions provided by the sender. Whichever approach was used, the sender would make sure the final text represented his or her intentions. Some New Testament scholars have debated whether some of the epistles bearing Paul’s name were actually written by Paul. Much of this debate deals with subtle differences in style and wording among the epistles. However, many of these differences can be explained by Paul using different scribes on different occasions with varying degrees of personal input. How does the doctrine of election apply to you? What does it imply about the importance of your personal faithfulness? Think of people you care about who are not members of the Church, and ponder Paul’s counsel to Gentile Christians regarding those in his day who had not yet accepted the gospel (see the commentary for Romans 11:18–21, 30–31). How could you apply Paul’s teachings to bless the lives of those who have not yet accepted the gospel? Consider the principles that Paul taught to guide Church members in matters of personal conscience (see Romans 14:1–15:3). How can you apply those principles in your own choices regarding what clothes you wear, what you eat and drink, how you observe the Sabbath, how you use entertainment and technology, and so forth? Using passages from Romans and other books of scripture, write a response to a person who uses Romans 10:9–13 to argue that all we must do to be saved is to profess belief in Jesus Christ. Select a teaching from Romans 12–14 that you could apply to create more peace and unity in your family, in a friendship, or in your ward or branch. After applying that teaching for a time, report on the results to a teacher, family member, or friend.